Are flexible schedules more valuable than a pay increase? Most companies agree that people are their most valuable assets. What they fail to realize is that for today’s worker, salaries are no longer a top priority. In fact, 62 percent of working professionals have left or considered leaving a job because it didn’t have work flexibility, according to a recent survey by FlexJobs. Instead, these workers seek jobs with flexible hours. The desire for jobs with flexible hours is so great that 15% of male employees and 21% of female employees are willing to give up some of their pay and slowing the pace of a career promotion in exchange for fewer scheduled hours at more accommodating times of the day. The idea behind increased flexibility on a workplace level is to create a work-life balance that works in favor of your business and your employees. Workplace flexibility can take on a number of different forms, depending on the needs and structure of your business. Gig economy jobs are also gaining momentum. These jobs let you stay in control of when and where you work. 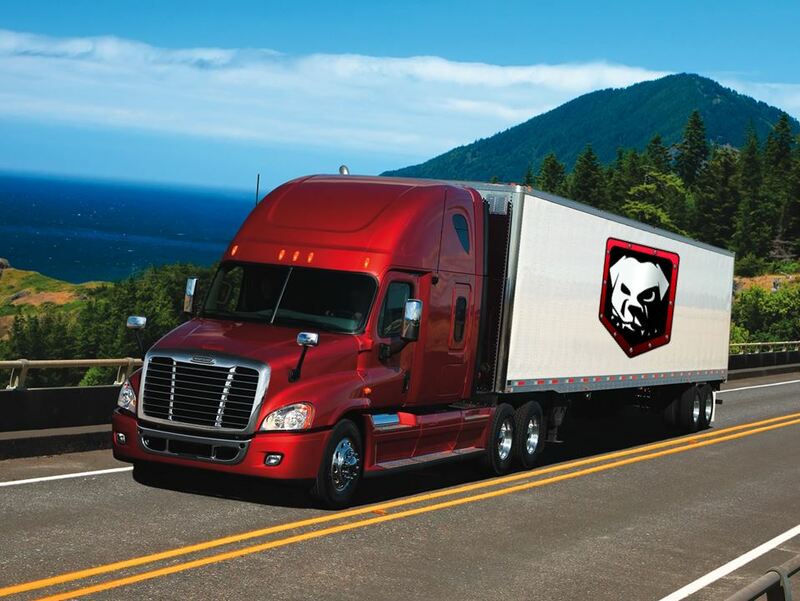 Road Dog Team, a staffing company in the brutally competitive manufacturing and trucking industry, has changed their value proposition to their employees, using the hashtag #MyWorkChoice. Citing ‘shorter shifts’ and ‘flexible scheduling’, Road Dog Team is differentiating it’s work opportunities by empowering their workers to take more control of their schedules using an app. 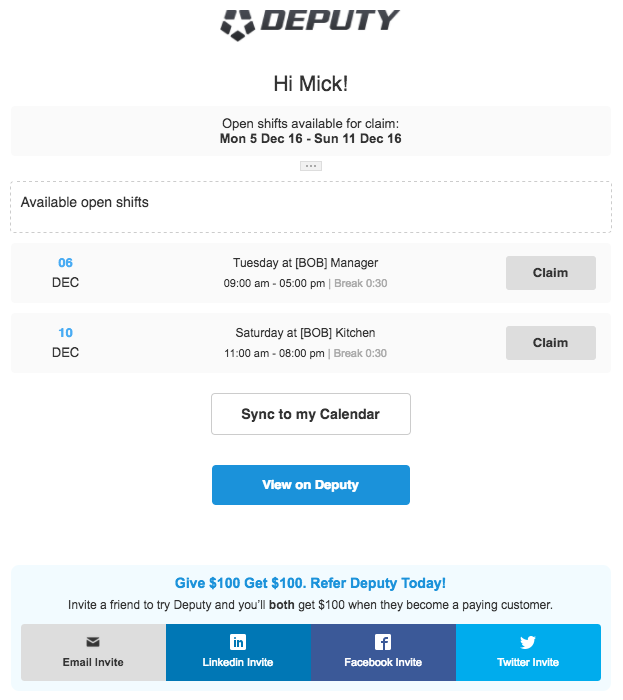 Using Deputy’s Open Shift feature, employers can now offer flexible scheduling, allowing managers to offer shifts out to available, properly trained employees who won’t exceed overtime or other labor rules. Increasingly, demand for open-shift scheduling has grown as more organizations realize set schedules simply don’t work for them. Staff are able to choose their shifts that best align with their life schedules, all within a centralized location. Get notifications of open shifts sent directly to your mobile device or email. It’s as easy as that. Deputy’s Open-shift scheduling feature is a compromised solution for both employees and employers. This flexibility allows employees to be empowered all while ensuring coverage of shifts. Further, if a shift needs covering at the last minute, it can be set to open and will notify all available employees once it becomes available. Open shifts help make flexible work possible and will only continue to rise in prominence. Allowing your employees to work from home might not be such a bad idea. A new study from the staffing firm, ManpowerGroup, points out that employees have a lot of reasons for wanting more flexible schedules—including work-life balance, the opportunity for side income, learning opportunities, and the potential for gaining control over their schedules. The reasons differ based on demographics. It’s not surprising that employees today are demanding more flexible work hours. It’s estimated that by 2020, 60 million Americans will be independent workers – freelancers, contractors, and consultants. This growing demand for flexible schedules is obvious, particularly among younger workers. According to the U.S. Bureau of Labor Statistics, more than 20 million Americans actively choose part-time work. However, finding a full-time job isn’t the issue. For most, working part-time is a result of simply not being able to commit to 9-to-5 jobs. More people are wanting a better work-life balance and the gig-economy has made it possible for those people to support themselves and their families. Employers can benefit from these temporary jobs as well. However, one-third of this demographic, choose part-time work so they can follow their passions. These workers want to design their own careers. Many are young and college-educated, and they want jobs with flexible hours that will cater to their lifestyle. The morale boost gained from improving their work-life balance can also result in increased employee productivity and performance. According to the National Workplace Flexibility Study, 98% of managers who implement a flexible work schedule see no negative drawbacks. Rather, they see results like better communication, interaction, and productivity. More research by Stanford professor, Nicholas Bloom, found that working remotely increases productivity, overall work hours, and employee satisfaction. Working in an office atmosphere 40 hours a week may affect your productivity. Between interruptions from co-workers, a loud atmosphere, and other distractions, it can be hard to focus on your work. If an employee has the ability to work remotely from home, they also save time on their commute, which means they may be more inclined to start work earlier and finish later. It’s no longer the case that every employee needs to be in the office to be productive. Believe it or not, almost half of Millennial employees will actually choose flexible schedules over pay. Even further, 86% of workers say that work-life balance is a top career priority. Because they are tethered to technology, millennials naturally gravitate toward remote employment situations. Millennials are redefining the way we work, benefiting both employee and the employer. Jobs with flexible hours and remote work can benefit the company as a whole, producing happy, healthy, and productive employees. These are the environments younger generations want to work in. If workplaces want to accommodate the next generation of workers, then the first step will be adapting to a more flexible schedule. Organizations would be wrong to dismiss these expectations and those that do risk being left behind in the battle for the best and brightest young professionals. Simply put, strict hours are bad for business because they’re bad for employees. Inflexible hours, especially combined with low wages, place demands on employees that cause stress. This affects both themselves and their families, leaving them hungry for more time. In fact, research has proven it is often hazardous to employee health. Excessive stress can result in poor heart health and lead to sleep problems, too. Too much work can also reduce or eliminate time available for healthy activities like physical exercise, which can improve mood and memory and prevent physical complications like high blood pressure and heart disease. Finally, excessive work can mean excessive stress, adding to the risk of high blood pressure and chronic heart disease. Flexible work arrangements are becoming more than a trend. It’s also a cost-efficient way of keeping a business running. According to Flexjobs, an increase in telecommuting could save businesses and workers more than $700 billion a year, and feeding into that number are decreased absenteeism, reduced turnover, and lower travel and gas expenses. There are many cost benefits to consider, such as shutting down the office entirely for one day every week. During that day, no one is draining utilities like electricity or water, and you’re saving on smaller investments, too, like kitchen and office supplies. If the work can still get done, what may seem like small cost savings ultimately makes a huge difference. Labor costing can also become a burden. This includes costs associated with employing your staff. Optimizing your schedule and using an employee scheduling software can provide tools such as labor forecasting to help ensure you have the perfect amount of staff schedules. To read more about labor forecasting with Deputy, click here. In an on-call scheduling system, employees often have little to no notice or guarantee of when they’ll be required to work. Research has shown that workers with irregular schedules are more likely to experience work-family conflicts and have higher levels of work stress. Improving your scheduling process with flexible work options can prevent avoid no shows at the workplace. On-call scheduling can also hurt your company legally. In fact, many states have passed predictive scheduling laws that ban ‘on-call’ scheduling, such as New York City’s Fair Workweek law. If you are an employer in New York, you may be subject to these laws and can face hefty fines. Read and download our quick guide on how your business can stay compliant with these new regulations. The demand for quality flexible work is increasing in both the United States and internationally. Many modern companies are rethinking the rules of the workplace. The idea that every employee needs to work the exact same schedule is no longer commonly accepted. More and more companies are now allowing their employees to work flexible schedules instead.It’s time for companies to embrace the way of the workplace future. Workforce management solutions, in combination with open-shift functionality, provide a solution for a better work-life balance for employees and employers. As the workplace relies on technology usage more, it will become increasingly easy for most industries to adapt to a scheduling software with confidence that their employees will use and benefit from it. By doing so, employees and employers can achieve the flexible schedule they desire. Ultimately, those organizations that embrace this shift will be the market winners in recruiting and retaining top talent. By using Deputy’s workforce management software, you can create a work-life balance that works in favor of your business and your employees. To learn more, schedule a customized demo below to see it in action. The post Are flexible schedules more valuable than a pay increase? appeared first on Deputy. A number of states and cities have passed predictive scheduling laws that mandate how employers can schedule employees. These laws are also commonly referred to as restrictive or advanced scheduling laws. Vermont has not passed a full-fledged predictive scheduling law. However, the Green Mountain State has passed a workplace regulation that is closely related to predictive scheduling laws and sometimes referred to as a lighter version of it. Employees interested in discussing the arrangement with their employers are invited to make the request in writing or verbally. The employer is then required to discuss that proposal in “good faith” and the discussion can take place in person or over the telephone. The law then requires that employer to provide the employee with a notice of their decision in the same format as the initial request. If the employee requested the change in writing, then the employer must respond in writing. Vermont and New Hampshire have very similar flexible scheduling bills in play and employers should take the hint: this is a trend that is pushing towards more regulation, not less. It’s important that businesses prepare for what will likely be a renewed effort to pass predictive scheduling laws in the northeast. With New York joining cities like San Francisco and Seattle, it wouldn’t be shocking to find Burlington jumping into the mix. These laws are a compliance nightmare and businesses that don’t partner with the right technology firm will be sure to suffer fines and penalties. The post Predictive scheduling meets flexible scheduling in Vermont appeared first on Deputy. New Hampshire lawmakers have given employers of the Granite State a very clear indicator that they mean business when it comes to labor regulations. For over a year now, New Hampshire has put in place restrictions on the scheduling relationship between employees and their employers. While lawmakers have yet to pass a full battery of scheduling regulations like some municipalities throughout the country, they have passed significant legislation that sends a very clear signal that they are ready and willing to do so. That signal came in the form of Senate Bill 416. Otherwise known as the Flexible Working Arrangement Law, SB 416 provides protection to employees that wish to discuss a flexible scheduling plan with employers. Flexible scheduling is sometimes included in predictive scheduling laws and enables employees to structure their working hours around certain known life events such as a university night course. The idea is that an unpredictable schedule can constrain employees and prevent them from further developing themselves. The New Hampshire law does not require employers to provide flexible scheduling to employees, it simply protects them from any punitive termination in response to their request. A Warning Of What Is To Come? Businesses should take note since this legislation is likely only the beginning. During the bill’s debate, a number of amendments were proposed but not passed. For example, some lawmakers wanted to include a minimum 4 hour pay rule that would force employers to pay employees at least 4 hours worth of wages regardless of how long they worked. Others wanted additional provisions to prevent employers from turning down flexible scheduling requests – such as having to provide a specific business-related reason in writing. Additionally, lawmakers are considering an additional piece of legislation, House Bill 1222, submitted by state representative Janet Schmidt. The bill would prevent businesses from asking employees certain questions during the interview process. The bill’s primary purpose is to prevent employers from asking what potential employees earned during their past employment. For now, employers should meet with employees that make requests for flexible scheduling and promptly give them an answer. In preparation for the future, businesses might consider whether they should use an employee management system, like the one offered by Deputy. If New Hampshire follows the path of Oregon this is just the first step. Already cities across the country are turning to predictive scheduling. From San Francisco to Seattle and from Seattle to New York, predictive scheduling is the restrictive reality that businesses face. In order to properly prepare for any labor regulations, proactivity is always the best course of action. An affordable and comprehensive solution will make any transition as seamless as possible. The post New Hampshire’s flexible approach to workplace scheduling laws appeared first on Deputy.